Spread prosciutto slices with Neufchatel cheese. 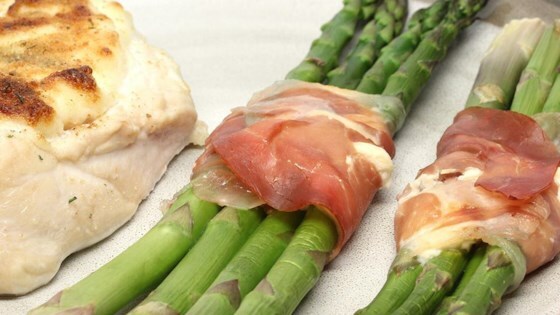 Wrap slices around 2 or 3 asparagus spears. Arrange wrapped spears in a single layer on a medium baking sheet. Bake 15 minutes in the preheated oven, until asparagus is tender. I know that people have rated this better then I will...I just didn't really like this. I think when it comes to my asparagus...I'm just a plain jane!!! Phenomenal. The best asparagus recipe I have seen. Make sure to baste the bundles with olive oil so they don't dry out. This is great cold appetizer. Blanche asparagas and immerse in icewater. Makes the asparagas bright green. Very Delicious!